Training on Maharashtra-eSamikSha (an Online Monitoring and Compliance Mechanism) via Video Conferencing held on 19th January 2018. 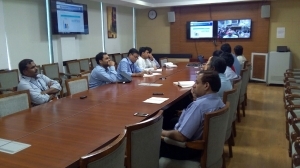 Officials of Cabinet Secretariat Informatics Division via Video Conference during discussion with participants. Discussion with Officials of Government of Maharashtra. eSamikSha, an online Monitoring and Compliance Mechanism has been developed by Cabinet Secretariat Informatics Division, to fast track the compliance of pending action points, proposal, targets, etc. 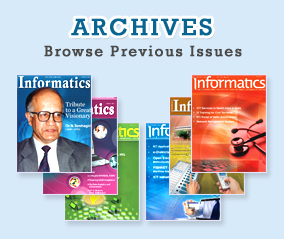 of various Ministry/Department/Organization/Agency of Govt. 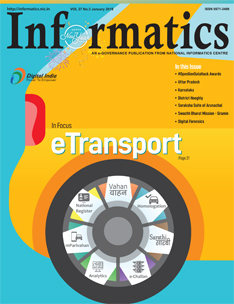 of India and Government of States and UTs. The Portal has been designed in such a way that it will enhance efficiency, bring transparency, reduce the need of protracted correspondence and improve the communication between Government to Government (G2G). With the great success of eSamikSha portal, Chief Secretary, Government of Maharashtra had desired to host Maharashtra-eSamikSha similar to eSamikSha with minor customization for the use of Government of Maharashtra. eSamikSha monitors the compliance status for various categories like Items Monitored by Chief Secretary, etc. Customized Information Dashboard also presents the statistical view, various correspondences at a glance. 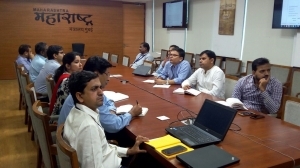 In this context, a training session on Maharashtra-eSamikSha Portal, were conducted for the officers of Chief Secretary Office, NIC State Unit, and various departments. Training session has been taken by Mr. Akash Kumar Gupta, Scientist ‘B’ and Mr. Vijay Tiwari, Scientist ‘B’ of the Cabinet Secretariat Informatics Division. Training has been attended by officials of Government of Maharashtra, during the training session all the modules of Maharashtra-eSamikSha have been explained in detail. It has also been explained that how Maharashtra -eSamikSha will cater their need. The training session has been ended with the question & answer session and vote of thanks.